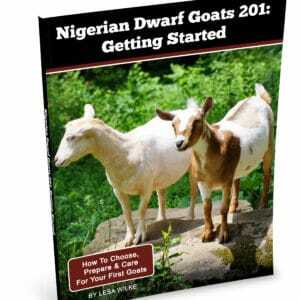 Nigerian Dwarf goats, folks seem to question whether they can take the cold. We live in Northeastern Ohio, so temperatures of -15°F are pretty common. If goats are housed so that they can get out of the wind and stay dry (and they’re receiving adequate nutrition and health care), then they generally tolerate temperatures that cold without issue. Even in the coldest areas of the US, goats can tolerate the cold winter temperatures if they’re dry and protected from the wind. 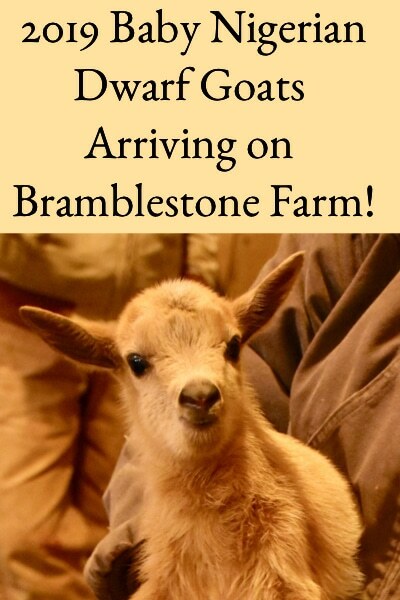 We have goat-keeping friends in Maine that don’t provide additional heat in their barns, and they’ve successfully kept goats for many years. 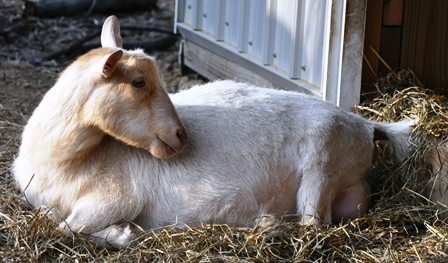 In winter, Nigerian Dwarf goats grow a nice undercoat of cashmere that helps to keep them warm. The fluffy cashmere fibers puff out to surround them (that’s why they look so fuzzy in winter) and keep warm air trapped around their bodies. 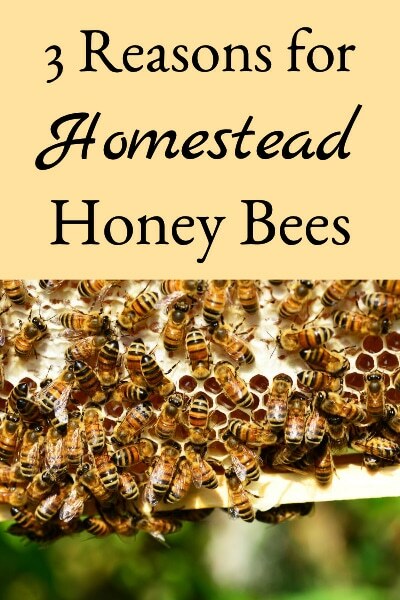 As long as they can keep that protective layer around them (and it’s not wet or has wind cutting through it), then they can tolerate cold temperatures. One way to think about it is if you can bundle up sufficiently to tolerate the temperature where you’re housing them; then they should be able to tolerate it with their protection. One thing that all goats do seem to enjoy in cold weather is warm drinking water. I’ve been quite shocked by how much they prefer the warm water, how big a drink they’ll take, and how warm (hot) they actually like it. For those of us keeping bucks and wethers, it’s important to remember that keeping lots of water moving through their systems helps prevent urinary calculi – so providing them with warm water is important not just because they like it, but because it also keeps them healthy. 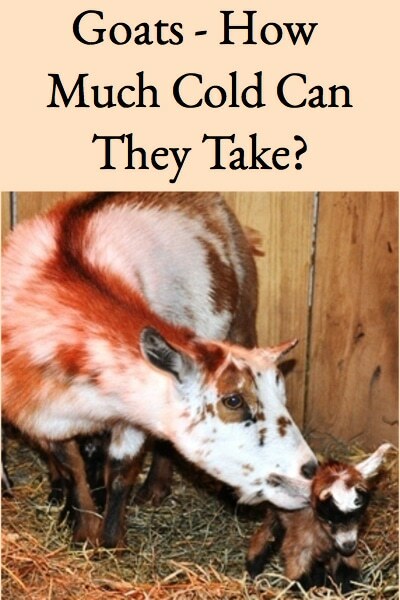 Goat babies are a different story. 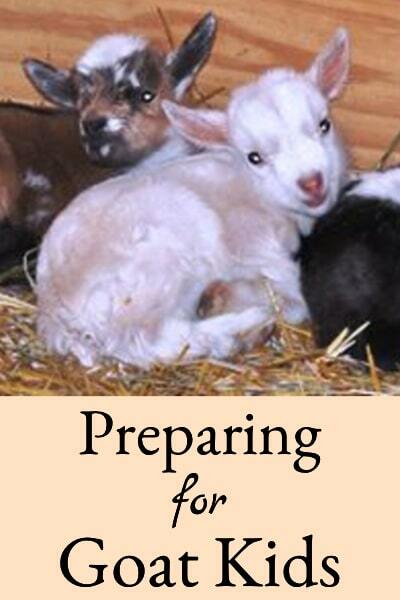 Goat kids are born wet and don’t have that dry protective layer. If temperatures are close to or below freezing, I think goat owners really need to be present when the babies are born to get them dried off quickly. Otherwise, the babies (or some part of the babies) freeze. We hear stories of this each winter and it makes us sad. 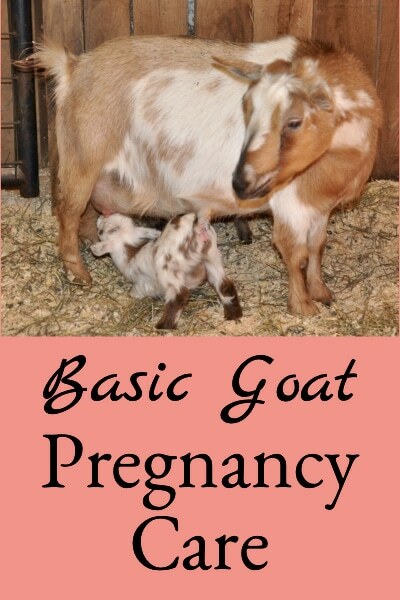 We also think that folks should have these basic goat kidding supplies on hand too. 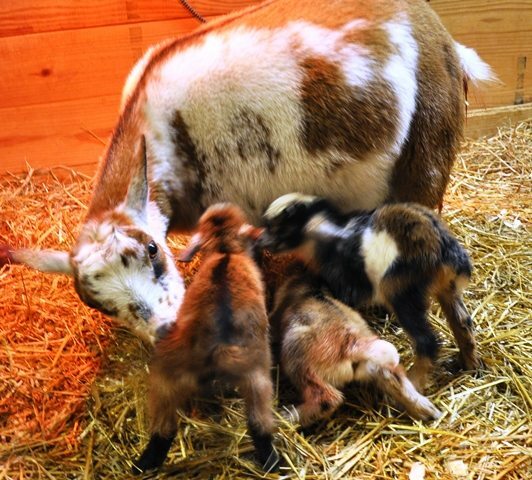 When does are due to kid during cold weather, in addition to being present to help get the kids dried off quickly, many goat owners use heat lamps to keep the kids warm. However, heat lamps are also the #1 cause of barn fires, so if using heat lamps, it’s critical to use sturdy models built for barn usage and use them correctly. I’m not big on recommending brands, but we’ve switched over to the sturdy plastic heat lamps from Premier1 Supply or carbon fiber lamps (shown here) and like these choices much better than the standard metal heat lamps commonly found in stores. They’ve got additional safety features that make it much less likely that they will start a barn fire. 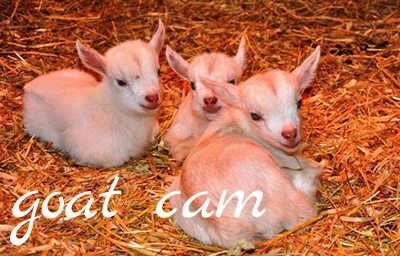 An alternative to heat lamps is to either make goat kid coats or provide the kids with huts to warm up in. 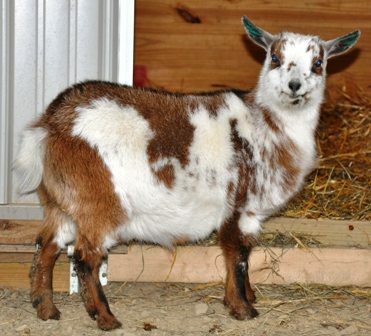 For our Nigerian Dwarf size babies, kid goat coats can easily be created from “onesie” outfits for human babies, or the sleeves of old sweatshirts. For sweatshirt sleeve coats, use the wristband as the collar, put the seam under the kid’s tummy, cut two little holes for the front legs, and trim the length to fit the length of the kid. Protective huts for the kids can be created by removing the door from a small dog crate or poultry carrier, and simply place it in the kidding stall. 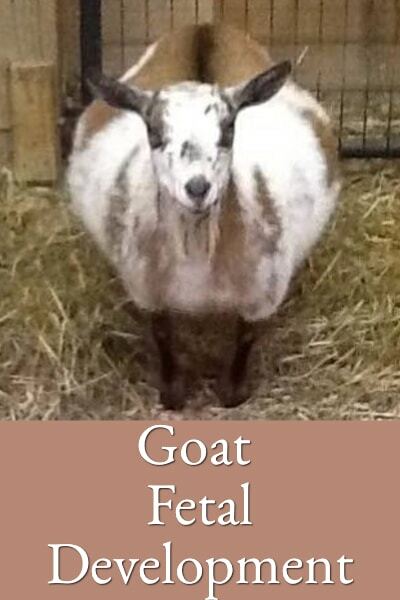 Goat does that are kidding are also less resistant to cold. I’ve observed that the rigors of kidding in cold weather often cause does to shiver badly – it’s just a lot of work and sometimes they don’t have the energy reserves left after kidding to keep themselves warm. We find that they appreciate the heat lamps we have in place for the kids, a nutritious-warm post-kidding meal, drinks of warm water, and some kind of covering (dry towel, blanket, or old sweatshirt). With a little special “after-kidding” care they return to normal quickly and are great mothers. 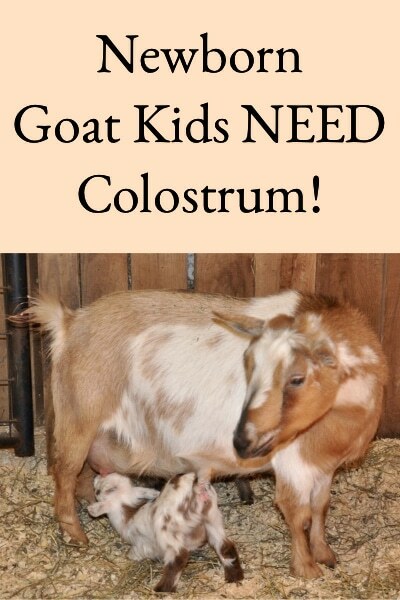 Because kidding does and new kids don’t withstand cold as well, we tend to breed does in late October or early November so that the kids arrive in mid-March or early April (goat gestation is five months). That means that kids are arriving when the weather is starting to warm up in our area and temperatures aren’t so severe out in the barn. With proper attention, there’s no reason goats can’t be bred to kid earlier in the winter, we just find it more comfortable to plan for slightly warmer weather. 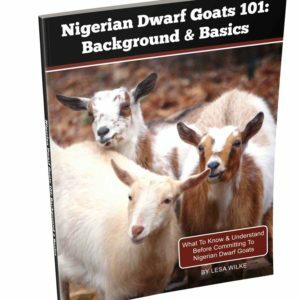 I found the information you provided on goats to be useful. I was wondering why where you ask for my email it automatically corrected it to all caps. I was thinking that could be a problem with getting some addresses correct.